Dana Air has pledged to continue supporting capacity building initiatives and professionalism in Nigeria's aviation industry. Dana Air's Chief Operating Officer and Accountable Manager, Mr Obi Mbanuzuo while speaking at the event said, ''Dana Air is resolute in its support for initiatives like the Cabin crew contest and any concept that encourages professionalism and standards in the aviation sector and we see these as part of ways to further imbue and entrench it in our industry. 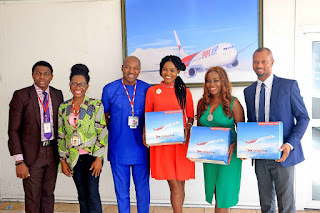 Also speaking at the brief ceremony, the CEO of Crew Training Institute, Katheryn Lademo said, ''we are grateful to Dana Air for the wonderful reception today. We are indeed proud to have you as the official sponsor for the Cabin Crew Contest. Dana Air is the headline sponsor of the first ever cabin crew contest. The airline's commitment and investment in training and retraining of its crew which she describes as safety officers has seen the airline's flight operations crew bag numerous awards. Currently, The airline's crew members – Master Collins Ginika and Ms Chiogor Okani are the reigning King and Queen of the air at the 2018 edition of the Nigerian Aviation awards, a recognition they bagged as winners of a cabin crew contest among domestic airlines at the awards ceremony.